This is enough space for a normal winter day or an epic summer one. I don’t do too many things that require two tools, but when I do, it’s nice to be able to strap them to my pack. I need to be able to get to food and store small items without taking my pack off, or having stuff in my pants pockets bumping against my leg. 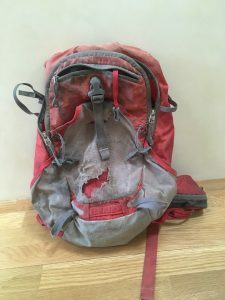 Why do no mountaineering packs have stash pockets? Even people doing “Extreme Alpine Assaults” need to eat and store things. Sometimes I can fit crampons inside my pack, but sometimes I can’t or don’t want to. They don’t need to be super-substantial, but the pack needs to not flop around while jogging. If it costs $100+, it had better last at least a few years. Many packs have all sorts of weird straps and doodads that catch on things and add weight. Sometimes simplicity is best. Take a Gregory Verte 15, add a couple of side stash pockets, and you’d have a condender. 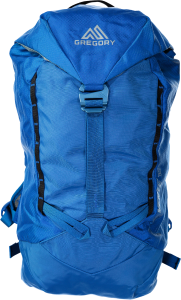 The BD Blitz 20 is similar (and no, a “waterproof zip pocket on lid” is not “easily accessible” for anyone with normal shoulder flexibility, as the pack still needs to come off). The Ultimate Direction PB Adventure Vest 3.0 looks decent, but I’m not sold on vests for everyday scrambling, it goes a bit overboards on bits and bobs, and its 13.3-oz weight suggests that it’s made of tissue paper. I’d happily carry 1/2 pound more (and probably save 30% in material cost) for something that lasted longer. I hear ya. Vests are weird for scrambling. I tried a skimo pack but it was weird and wouldn’t last long due to the super lightweight fabrics but did have some super cool features. It was one the the UD ones I’m not sure which model and its currently in storage in Canada. Another option that I haven’t actually tried myself but might in the future is to attach a removable water bottle holder to either the should strap or waist strap to give you front mounted stash pockets. 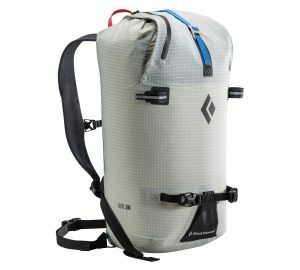 Back in the day (2009-2012) I used a Franken-pack that started out as a Camelbak Blowfish (10-15 liter). Then I added two tool loops to it with a grommet kit and a bit of accessory cord. Finally, I attached a small bike saddlebag to one shoulder strap to hold food, while my camera case was on the other. That thing lasted me for years; maybe I should revert to my old ways. Hi Sean! I have noticed your concerns/lack thereof, on alpine packs. Glad you’ll be making your way to the Ranch. See ya soon. I completely agree. 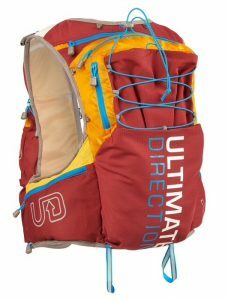 I’ve liked the Ultimate Direction Fastpacks, they also have a little bit more room than the vests in case I’m bringing a harness and rap rope or light overnight gear or whatever. But I can totally get the durability concern there. I’d be interested to hear what you settled on!